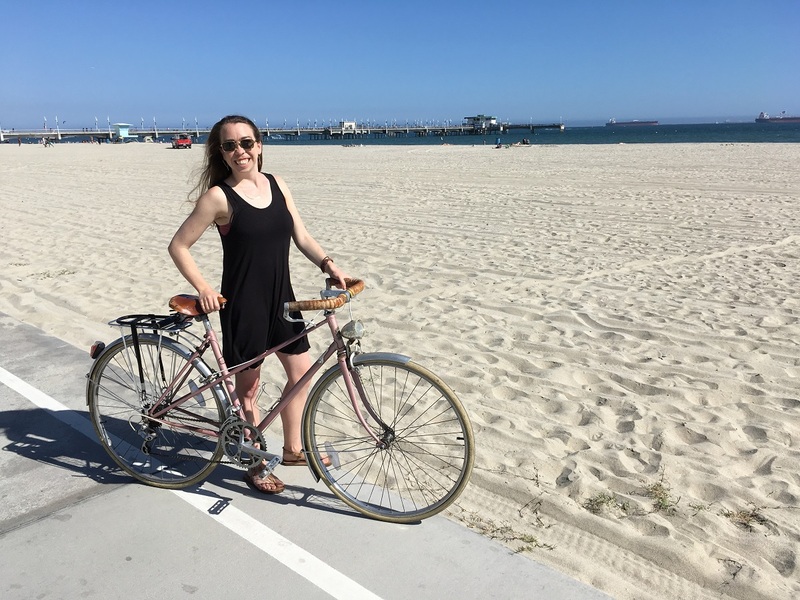 Last week, bicyclist and engineer Katie Taylor (@kmt88) brought @longbeachpost followers on a fun ride around town. From a stop at Belmont Brewing Company all the way to 4th Street Vine on Retro Row, Taylor hit up all the local favorites. She even swung by Cal State Long Beach for a quick jog with the Long Beach Frontrunners, an LGBTQ-friendly running club. [#TAKEOVER] Sunday we headed over to #Patchworkshow at Marine Stadium. My roommate is still new to riding around Long Beach, so the Vista bicycle boulevard made the trip a breeze. I picked up some earrings, a succulent gourd and an amazing cinnamon pull-apart from @colossusbread. Kristen and I used to attend book club every week like five years ago, and it was so great to see her back in Long Beach baking up a storm. Her Kouign-amann at @roseparkroasters on Mondays has blown my mind – seriously, if you like croissants and pastries, you have to try it. ### We’re letting #lbpost reader Katie Taylor (@kmt88) take over our Instagram for a week to showcase her #LifeinLB. Interested in a #takeover? Send us a DM with your email, a little info about yourself and why you love #LongBeach. What about Long Beach enticed you to move here from Georgia eight years ago? I graduated college in 2010, and job opportunities were very scarce. I wanted to stay in the southeast; in fact, I had never traveled west of the Mississippi River! But my job offer was for an ~18 month developmental rotation in Carson, California. My parents pitched a huge fit about me moving across the country, but I held my ground—what other choice did I have? We flew out to apartment shop in the south bay. In Long Beach, we waited outside the beautiful Lafayette building to see a studio. A woman walked up to us from down the street with a cup of coffee in her hand. I immediately fell in love—I could walk places?? To get coffee??? I ended up settling in Alamitos Beach and I still haven’t left. [#TAKEOVER] Sunday evenings bring my favorite drink in the world: the “wasted turtle” of sour beer + homemade red sangria @4thstreetvine. A couple of these and you’ll be having a reeeaaalllly good time, especially with cool cats @shybutflyyandtheallstarz. Then to my surprise, new friends and neighbors closed out the night with their band @thethingzlbc. The best part of Long Beach is bumping into people you know, am I right?? ### We’re letting #lbpost reader Katie Taylor (@kmt88) take over our Instagram for a week to showcase her #LifeinLB. Interested in a #takeover? Send us a DM with your email, a little info about yourself and why you love #LongBeach. How did you get into riding bikes and what do you love so much about the bicycling community here? I didn’t ride bicycles in Atlanta at all. I had this image of racers and mountain bikers in my head. But soon after moving here, I saw women in dresses riding beach cruisers down the beach path. I thought – I can do that! My first Walmart beach cruiser was stolen a month later (PSA: lock up your bicycle even in a closed garage). I wandered into the original bike station looking for a new one. A man sleeping in a folding chair stirred and said, “I can sell you one.” His name was Bernard, organizer of the Cyclone Coasters vintage bicycle ride. Next thing you know, I’m riding with 200 vintage bicycle aficionados on my 1948 Shelby beach cruiser. I love the sense of community around bicycles here. I always say it’s impossible to ride around without smiling. Everyone is so friendly and welcoming. I have made so many of my friends here through riding bicycles, and I’ll always be grateful for that. [#TAKEOVER] “That’s a classic Mimi pose right there," she said when I showed her the picture. “Arms outstretched for a hug!” It was a long commute home, and Mimi really brightened my day when she skated under my balcony. I’ve met her only recently through the neighborhood, which makes spontaneous encounters like this even more fun. I feel fortunate to know her – she exudes joy, whimsy and thoughtfulness, and she invests in making Long Beach a great community through roller skating. Join Mimi on Tuesday’s 5:30-7PM and Thursday’s 6-8PM at @bayshorerinkparty for skate lessons and an outdoor roller rink party! Tell her Katie sent you 😉 ### We’re letting #lbpost reader Katie Taylor (@kmt88) take over our Instagram for a week to showcase her #LifeinLB. Interested in a #takeover? Send us a DM with a little info about yourself and why you love #LongBeach. What do you do for a living and what do you enjoy most about your job? I’m an engineer! My background is chemical engineering, but I’ve held a lot of different types of jobs, including most recently operations supervisor. I enjoy solving big hairy complicated “gray area” problems. I am fascinated by tradeoffs, risks, uncertainty, optimization, safety… I want to know how to make the best decision with limited information. [#TAKEOVER] I can’t remember how I met @tiffanydavy; it’s like she’s just a part of Long Beach. Spend just a few minutes with this lady and you’ll be as inspired as I am. She comes from a family that values clothing makers across different countries and generations, and she’s working hard to bring #FashionRevolution to Long Beach. The fashion industry is undergoing a great awakening in search of ethical & sustainable work practices. Tiffany’s been engaging people here in the community for the past decade, and now’s the time to bring folks together with @fash_revusa and start the work. Catch her slinging styles and smiles on the weekends at @meowvintagelb. You won’t be disappointed. ### We’re letting #lbpost reader Katie Taylor (@kmt88) take over our Instagram for a week to showcase her #LifeinLB. Interested in a #takeover? Send us a DM with a little info about yourself and why you love #LongBeach. I saw that you recently became engaged! Congratulations and how did you two meet? Thank you! We met online through OkCupid. Our first date was at the original Simmzy’s in Manhattan Beach, and he was an hour late. If I wasn’t facing one-hour-plus of traffic myself to go home, I would have left. Instead I had a beer at the bar, and the rest is now history. This is the only time I’m grateful for LA traffic. [#TAKEOVER] Last night I swung by CSULB to meet up with my old friends Assaf and Ryan. They host a gay and lesbian oriented running and walking club called @lbfrontrunners. The club here has been around since 1984 as part of the International Frontrunners! I “forgot” my running clothes so this time I just made them model and run for me 🙂 They’re open to all levels, from beginners to sprinters or just people who like a good breakfast. ### We’re letting #lbpost reader Katie Taylor (@kmt88) take over our Instagram for a week to showcase her #LifeinLB. Interested in a #takeover? Send us a DM with your email, a little info about yourself and why you love #LongBeach. If you were a superhero living in Long Beach, what would be your superpower and how would you use it to assist the community? Oh, my friends would laugh that my brain is too literal for this question. I’m not good at silver bullet type solutions, but I would love to help our people experiencing homelessness. I’d like to snap my fingers and give everyone a safe, warm, happy home they want and can afford.